Thanks for inviting me to the show, was great fun. Evon Gnashblade – For Lion’s Arch! In the aftermath of the assassination of a Captain’s Council member, the prominent merchant Evon Gnashblade has made a bid for the dead pirates seat. 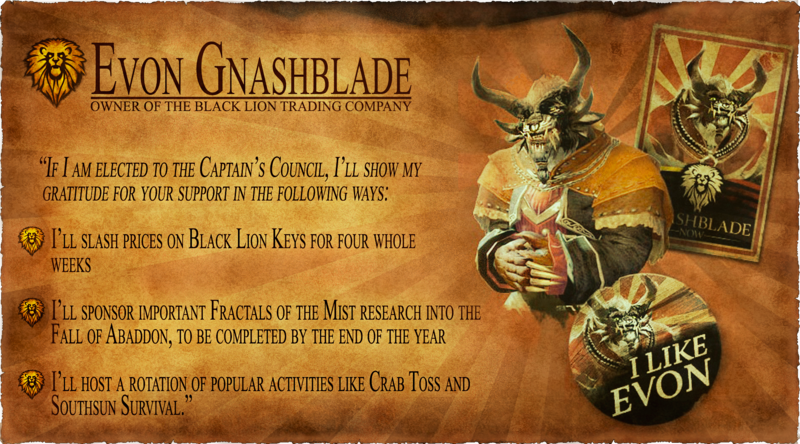 When asked what he had to offer Lion’s Arch, the cunning Charr, in true cut-throat style, promised to slash prices at the Black Lion Trading Company. “As owner and proprietor of the Black Lion Trading Company, I have the proven leadership skills and business acumen that is sorely needed on the Captain’s Council. With your support, I will secure a trade agreement with the Zephyrites that benefits us all. It will come as no surprise to anyone that his blatant act of bribery has been welcomed by the general population. Will you let Evon buy your vote, or has Ellen Kiels won you over with her own golden enticements? 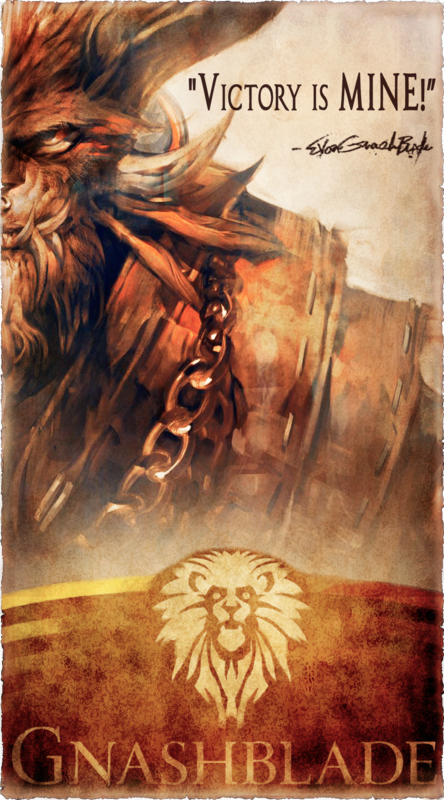 Only time will tell, but on the 2nd August do not be too surprised to see Gnashblades face plastered on every wall in Lion’s Arch. 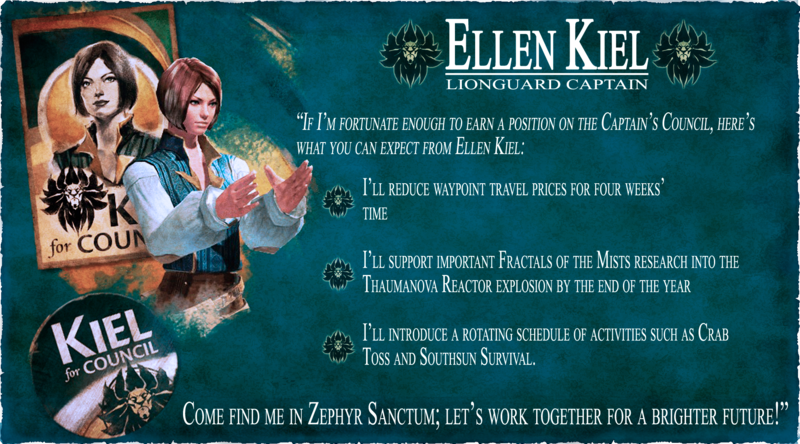 Ellen Kiel – Lionguard Captain for Council! After heading the investigation into the assassination of a Captain’s Council member, the Lionguard Captain Ellen Kiel has joined the race to win the now vacant council seat. When we caught up with the human in Lion’s Arch, the Captain shared her tactics to ensure victory at the polls. 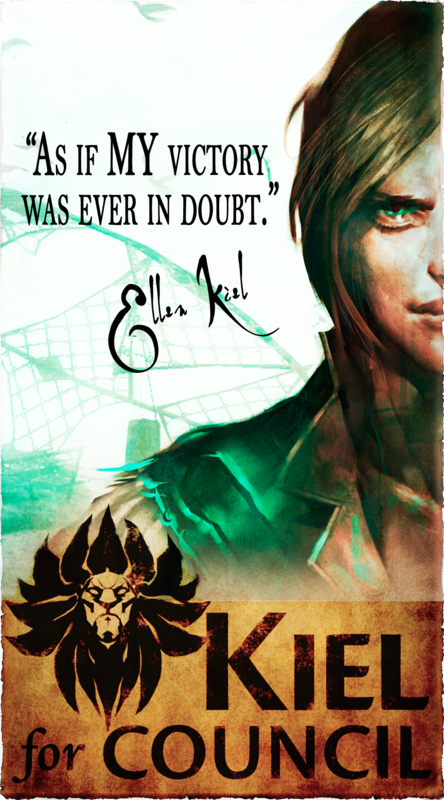 “I’ve stood by the people of Lion’s Arch in good times and bad, defending her from all manner of threat. Now I want to ensure the security of our beloved city in a different capacity, as a member of the Captain’s Council. I’ll need your support to establish a fair trade treaty between Zephyr Sanctum and Lion’s Arch. Some will see this price reduction as a publicly minded act of charity, others as a counter offer to the financial inducement from her rival Gnashblade. Whatever your opinion, she is a strong candidate, and will give her Charr adversary a run for his money. Has the Captain done enough to garner your support at the polls, or is she just another power hungry wannabe politician? Only time will tell, but on the 2nd August if the streets of Lion’s Arch are filled with drunken brawling humans, you will know who has won. Sky pirates take over Lions Arch! Chaos has come to Lion’s Arch and the culprits responsible for the mayhem have holed up in their hideout! Inspector Ellen Kiel spearheaded the investigation into the murder, and she’s now gathering teams of deputies to capture the perpetrator. Better sharpen your weapons and skills—this criminal promises to be a slippery eel! Harrison Polo is a GW2 RP’er and writer who has featured in The Krytan Herald. I wish him great success with his Vlog. I came across a statement that I felt summed up the idea behind guilds well. It went something like this, “a guild is a group of like-minded individuals working together to accomplish common goals”. In many MMOs the main purpose of guilds is to help players advance through game content. This means helping players level and run them through instances and raids in order to gear. However, this isn’t the only purpose of guilds. In some circumstances some guilds are more focused on socialisation than in-game progression. Obviously, in all guilds, there exists a mixture of the two, progression and socialisation, but in different dozes. Unfortunately, I feel that GW2 guilds miss both of these elements. I’m sure most of you have logged in to find an eerily quiet guild, even though a good few members were online at the time. Or perhaps, you’ve logged in to find only a handful of you representing the guild, while the rest were representing other guilds. Whether the feature to join multiple guilds and switch between them is responsible entirely for a lack of socialisation between members in guilds is debatable. Though, there is no denying that this unique feature is partially to blame. Please click the Image below to open and read the full article. The sun was setting over the Nicholaides Manor upon the outskirts of the Salma District of Divinity’s Reach. There, I took tea with the Lady-Chatelaine, Zarabeth Nicholaides, her beloved Arthenon Moreau, the Minister of Fort Salma. Lady Zarabeth had put together what she deems her Tension Slayer tea, something that soothed the nerves and mind as we took company together outside upon a large balcony overseeing the rest of the city. ‘‘Lady Zarabeth,’’ I bowed to the Lady Priestess. ‘‘I thank you for accepting my invitation.’’ I took out my small leather bound journal, and looked across the table to her and the Minister. Please click to open and read the full 6 page edition.